240 pages | 6 B/W Illus. Religious and spiritual engagement has undergone multiple significant changes in recent decades. Researching Female Faith is a collection of essays based on recent and original field research conducted by the contributors, and informed by a variety of theoretical perspectives, into the faith lives of women and girls – broadly from within a Christian context. Essays describe and recount original qualitative research that identifies, illuminates and enhances our understanding of key aspects of women’s and girls’ faith lives. Offered as a contribution to feminist practical and pastoral theology, the essays arise out of and feed back into a range of mainly UK pastoral and practical contexts. While the essays in this volume will contribute to an enhanced appreciation and analysis of female faith, the core focus is on feminist qualitative research methods and methodology. Thus, they demystify and illuminate the process of research, including features of research which are frequently under-examined. 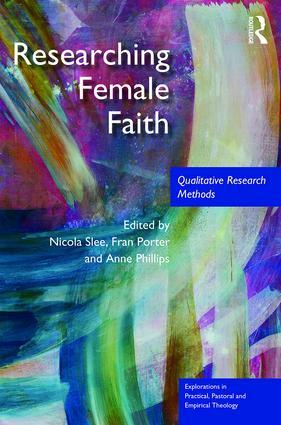 The book is a first in bringing together a specific focus on feminist qualitative research methodology with the study of female faith lives. It will therefore be of great interest to students, academics and practitioners with interests in faith and gender in theology, religious studies and sociology. Nicola Slee is Director of Research at the Queen’s Foundation for Ecumenical Theological Education, UK, where she oversees the doctoral programme, Professor of Feminist Practical Theology at the Vrije Universiteit Amsterdam, and Visiting Professor at the University of Chester. Fran Porter is Research Fellow at the Queen’s Foundation for Ecumenical Theological Education in Birmingham, UK, where she is involved in supporting and developing research work at the Foundation. Anne Phillips is a Researcher, Spiritual Accompanist, Retreat Leader, and, a Church of England priest in a Peak District, UK, parish.